Pea Shoots – Cut ’em & eat ’em! We believe there’s a time-honored way to get children eating fruits and veggies. It’s nothing special that we’ve developed, and its not rocket science. It’s available to almost anyone who has access to the sun, some soil and fresh water. And it makes fruits and veggies familiar and fun. That age-old secret? A garden. It can be a small garden tray or a giant field. Both work. 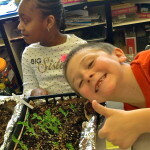 Because from everything that we’ve seen, when kids grow their own food, have fun outside, recognize their connection to the soil and water and plants, take part in the creation of their own fruits and vegetables, then they try their harvest. They try it and like it even. Often, they like it a lot. So we’re turning back the clock to when communities used to produce their own food for themselves. When kids ran around in the sunshine instead of peering at little screens all day. Back to when kids knew where food came from, how it got to their plate and how much love and work and effort it took to get it there. We’re focused with our school on their beautiful school gardens and getting the kids out there planting and growing under the big blue sky. 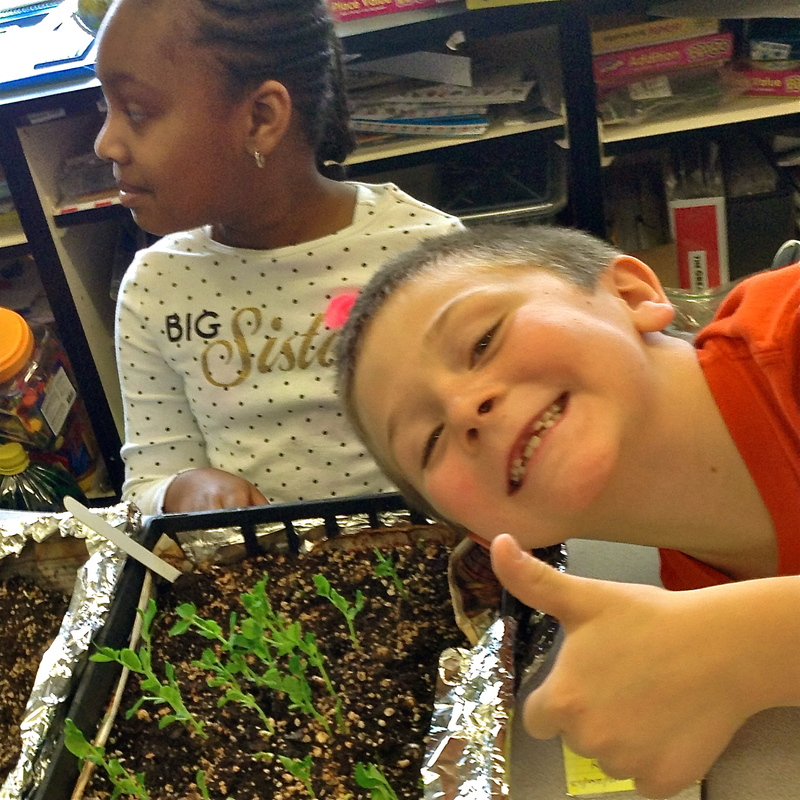 It’s a community-wide effort not just to grow healthy produce for the school cafeteria, but to grow healthy kids. Take pea shoots for instance. Cut them up and serve them in a salad bar without any introduction and there might be a few courageous takers. 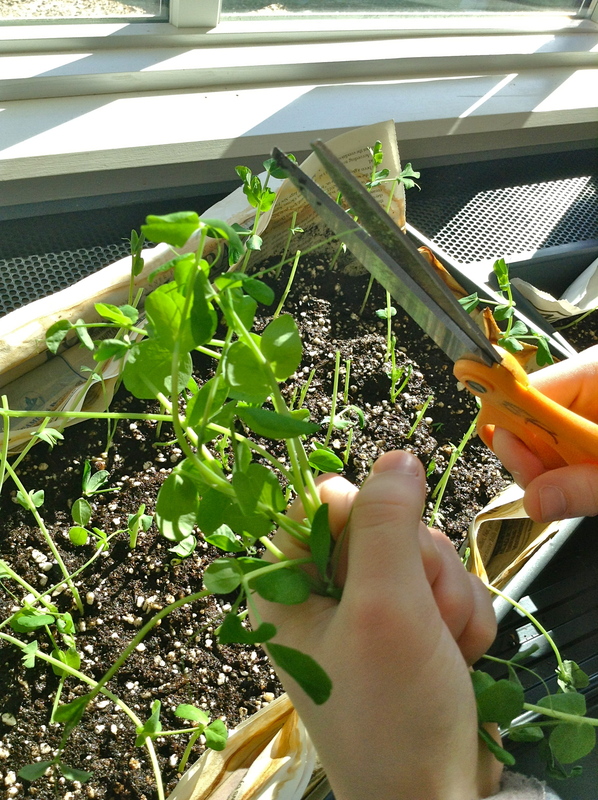 Plant seeds in trays in the classroom, measure them as they grow, give them “hair-cuts”, share them with classmates and you get a whole lot more buy-in. With a lot of requests for seconds. And thirds. 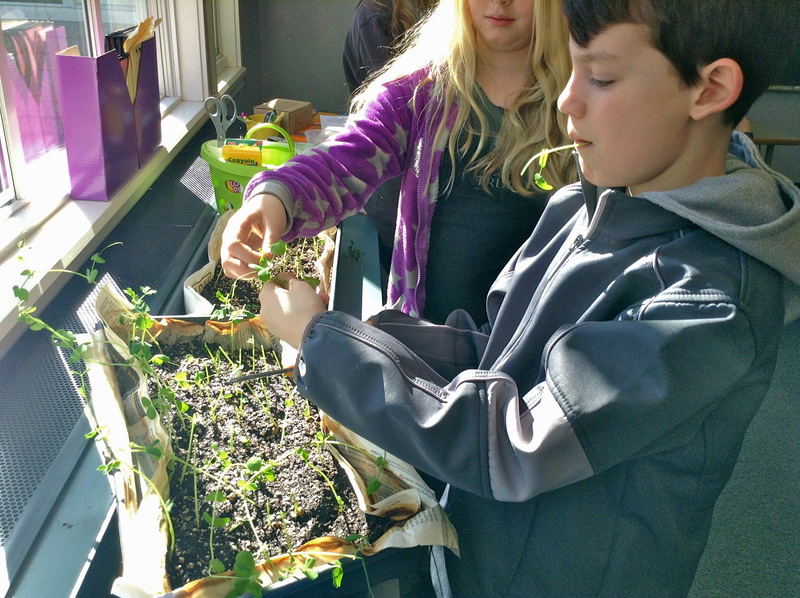 We did a straw poll in each class over the past several weeks as we harvested the first crop of pea shoots, planted a few weeks ago. 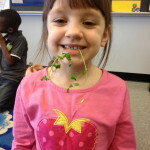 About 90% of the students said they would have skipped the shoots at the school salad bar pre-taste test. When asked if they’d choose these new greens after tasting their harvest, about 80% said they would definitely eat the pea shoots. That’s a pretty impressive transformation. Pea shoots are packed with nutrition, loaded with vitamins. 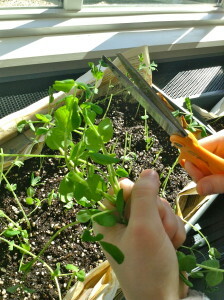 If you are a “foodie” and want to learn exactly how pea shoots qualify as a “super food” visit: http://www.peashoots.com/peashoots-nutrition.htm for all details of nutritional content of this amazingly simple food to grow. You can lead a horse to water but you can’t make him drink. And we can provide our children with healthful food, but we can’t make them eat it. There’s a lot of competition out there from salty, sugary processed foods with cartoon advertisements. 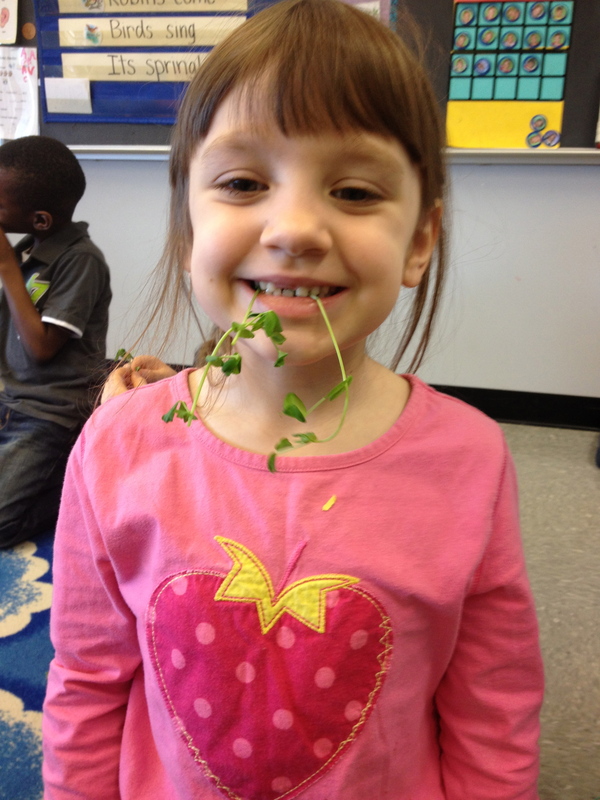 But we have found we can do a lot to make growing food fun. We start with seed and watch it grow. We do it together. We harvest and share. 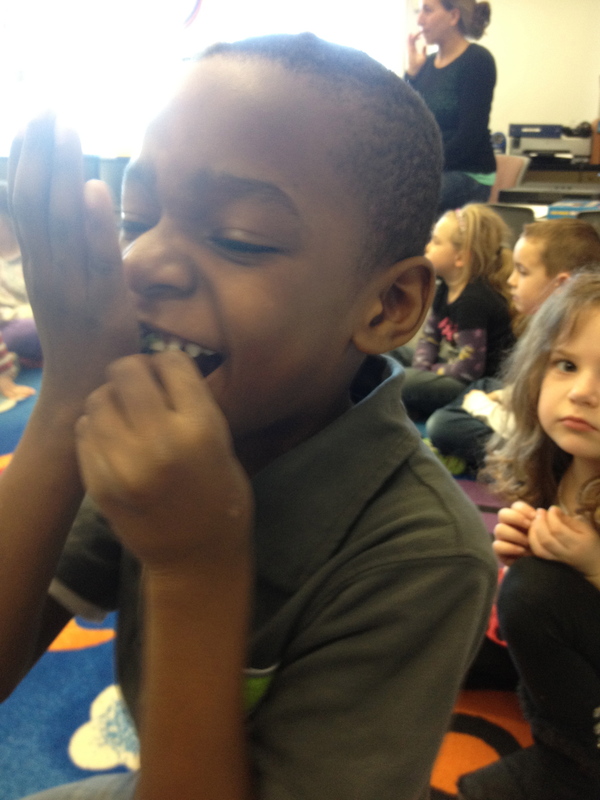 We learn and laugh. 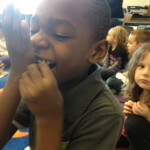 And fun and familiarity lead to kids trying new foods – actually choosing and liking new foods. Children are born innovators, experimenters. They love the magic of the growing food and sharing their harvest with friends. 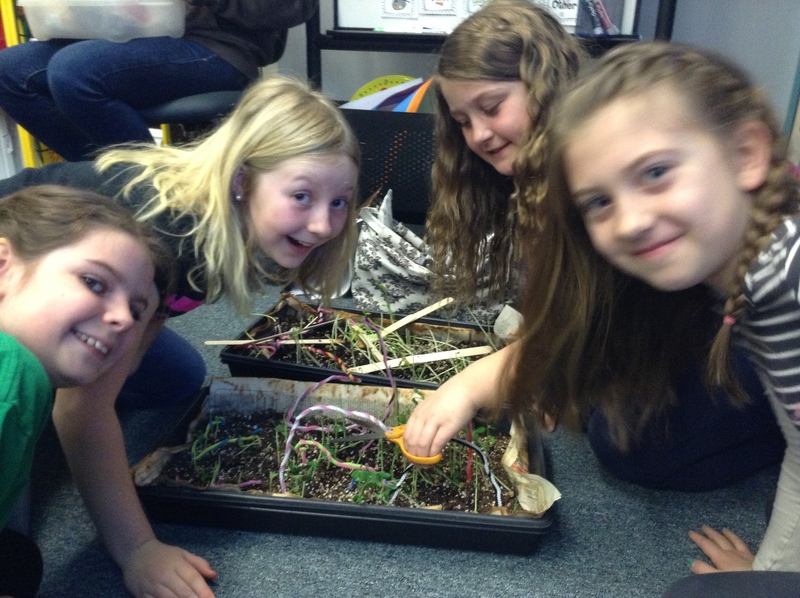 We try to give them positive and formative garden experiences that can help to shape their world. Healthful food is not only good, it’s fun. The more kids grow their own fruits and vegetables, the more they truly do become the architects of their own health and future. This post reflects the partnership and creative collaboration between The Motor Story and Sustainable CAPE.